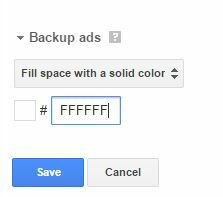 In case you see a yellow background under Google ads and if want to know how to remove it, following these 2 steps will solve the problem. The yellow background from Google ads that you see in wordpress can be caused either by the way you configured the ads in Google Adsense, either caused by a css code that is present in your wordpress theme. To be sure that the yellow background of the ad is not caused by how you configured the ad, Login to Google Adsense, go to My ads and check the ad that shows the yellow background on your wordpress. If you find it, change the default value to white or to other color that will match your wordpress background. Also change the option to fill the space with a color that looks good on your wordpress website. The other possible cause of the yellow background of the Google ads in WordPress is that the yellow color is actually specified in your css code. Open the stylesheet ( go to Appearance -> Editor and edit the css). Now search for #fff9c0 or #ff9 and replace it with some other color that looks better. For example #fff if you want it to be white.